The fb1C1XLG@A10 series is a high performance OEM hardware platform intended for 10/25/40/100 Gigabit Ethernet via QSFP+ and QSFP28, two PCI Express Gen3 x8 lane endpoints. 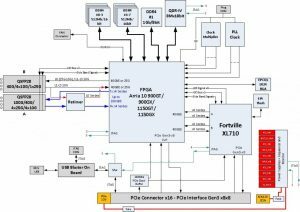 The card based on the Intel FPGA Arria 10 and Fortville Ethernet Network Controller XL710 dual port 40G with all its features as a leading controller in the market. The card is also offered with a variety of different FPGAs to provide flexibility for the intended application. The card is mounted with 8 x DDR4 devices running up to 2400MT/s, total memory 8GB, one device DDR4 1Gbx8 running up to 2400MT/s and one QDR-IV 144Mb density 18-bit data channels, running up to 1066 MHz. Regulation: CE, FCC Class B, ROHS 2 requirements.